Solar Panels convert the sun’s rays into electrical power – I think we all know that by now – but what are the if’s and but’s of it all, and the conditions that affect its operation and efficiency. Most of us also want to know how much solar is needed, and this question is covered in the section How Much Solar? So for now let’s take a closer look at the panels themselves, and then see how that matches up with conditions in Australia. Their full name, photo-voltaic cells, tells us that light is converted to electricity, and the efficiency of commercially available panels is currently 15-20%. The sun gives us about 1000 Watts per square metre (W/m2) and this is also part of the Standard Test Conditions (STC) that are used to measure the output of solar panels. Every panel has a label on the back which specifies its output parameters at STC: Maximum Power (Pmax), Open-circuit Voltage (Voc), Voltage at peak-power (Vpk), Current at peak-power (Ipk), and Short-circuit current (Isc). For a 12 Volt panel the open-circuit voltage will be around 22 Volts – or a volt or so either way. This 1000 W/m2 is of course only true around midday in summer but it gives us a typical figure to work with, and thankfully it’s used consistently throughout the solar industry. So using this typical figure for solar input, for every square metre of panel we should get about 150 to 200 Watts (15-20% efficiency x 1000Watts). If we check this out on a typical 60 Watt panel that measures 770 x 660 mm then we have 0.5082 m2 of area so we’re getting a typical input of about 508 Watts from the sun onto that area. So our efficiency in this case works out at 60Watts/508W = 11.8%. What happened? Why is our efficiency less than expected? Where did that power go? Well it’s more a case that we failed to capture the full amount of solar available. Have a careful look at a typical panel and you’ll see plenty of white space and wires, they are an essential part of the panel but it’s also space not covered by solar cells, so the efficiency we can actually achieve is less. So if we adjust for real-world factors then it’s close enough to give us some confidence in our solar panel, so that’s the good part. Something however that does make a difference, especially to us in Australia, is temperature. The panel voltage drops about 0.4% per °C and the power by about 0.5% per °C. The STC we mentioned before measures the panel output at 25°C and any increase above that is going to drop the voltage and power output of our panel. This is important for a number of reasons. In summer 40°C is not uncommon at all, and in the outback that might be a nice average summer’s day (hello Marble Bar!). For our solar panel this can mean about 65°C on its surface, maybe more – if you have a pyrometer, you can measure it, just don’t touch it! At 65°C this is a 40°C increase in temperature above STC (25°C), so our power will drop by 20% (0.5% x 40°C) and our panel voltage by 16% (0.4% x 40°C). This obviously means a decrease in charging current to the batteries but there is another effect that has important practical implications. Every solar panel needs a regulator, to make sure we don’t overcharge the battery when it’s full, and to give it everything the solar has got when the battery is low. You will probably have heard of the two types – PWM and MPPT – pulse-width modulation or maximum power-point tracking. Now this might get a bit technical, but hang in there, we’ll take it slowly, and the results are important. Let’s take the PWM first. When the battery voltage is low it needs maximum charging, so the PWM basically connects the panel straight to the battery and gives it everything the panel’s got. In doing so the battery pulls the solar panel down to its voltage, let’s take a typical 12.5 Volts for the battery voltage. 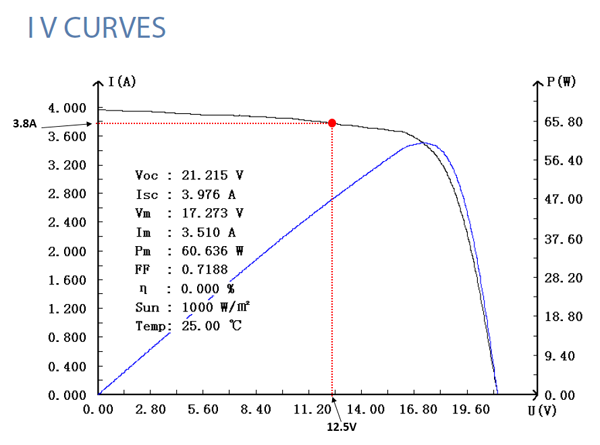 The diagram shows a typical IV-curve for a 60W solar panel which plots the behaviour of its voltage (horizontal axis) and current (vertical axis left). The blue line also shows Power output in Watts (vertical axis right). Now let’s see where that PWM regulator has placed us on the curve. If we draw a line straight up from 12.5 Volts (dotted red line) then it cuts the IV line (black) where the red dot is. To know what current this corresponds to, we draw a line across to the current axis and we have a current not far off the short-circuit current (Isc), just under 3.8 Amps. Ok, now what would the MPPT do in the same situation? The blue line shows the power available from the panel and the MPPT will look for the maximum power point. This is pretty easy to spot as it’s the highest point on the blue line (power). At this point the panel will operate at its peak-power voltage and its peak-power current, for this panel the figures are Vp=17.273V and Ip=3.510A. The MPPT technology is able to down-convert the higher panel voltage to the battery voltage (in this case 12.5V), and in so doing it also boosts the current. So for a 100% efficient MPPT the current would be (17.273V/12.5V) x 3.510 Amps = 4.85 Amps which looks like a nice gain over the PWM’s current of 3.8Amps – right? Remember that stuff about the temperature? In summer that panel’s peak voltage will be 16% less, which brings it down to (17.273V x 84%) = 14.51 Volts. Then there’s the regulator efficiency – most are around 90-96% at their best, so let’s be generous and say 93% efficient on average. So if we factor that all in, we have (14.51V/12.5V) x 3.510 Amps x 93% eff = 3.79 Amps. So we’ve paid a price-premium for the MPPT but it’s giving us virtually the same current as the less expensive PWM in our Australian summer conditions! For the PWM its output current is not affected by a drop in panel voltage – it’s still well above our battery voltage of 12.5V. The shape of the IV curve simply changes a bit and its operating point stays pretty much the same. So that’s why MPPTs make more sense in Europe and North America where it’s cold, because the panel voltages are higher. Here in Australia rather stick with a good PWM – some of the best ones are Australian made too. Now if you have a panel with an open-circuit voltage (Voc) higher than about 22 Volts, then you don’t have a 12 Volt panel. So if you want to charge a 12 Volt battery, there is little choice but to go with the more expensive MPPT option. The MPPT will then down-convert the voltage to suit your 12 Volt system and boost your charging current accordingly. Just check that the regulator can handle the open-circuit voltage of your panel – you’ll find that in the regulator’s specifications as Input Voltage. Also, if your system has higher battery voltages, say 24V or 48V then a good MPPT might well make sense, because the difference between battery and panel voltages is greater, and the MPPT can turn that voltage difference into more current for your batteries. And I must stress that it needs to be a good MPPT regulator. Fortunately most of the good forums & blogs have now wised up to cheap eBay regulators that claim to be an MPPT but when you open them up there’s just a simple PWM circuit inside – and a bad one at that! Rather just stick with well-known and tried-and-tested brands. Thanks Ziggy, for sharing such pertinant info. at 50% in the AM. however sadly it is a 12Volt 10 amp model. I am considering a stepup transformer of say 9-20 volts imput and 28 volts output. The other option is feeding it via a MPPT converter direct to the Batteries $x 250A Calcium. plus 2 high crank amps start batteries. Which option is the best? Will the MPPT scavenge from the 12 to 17Volts and step up the voltage with resultant amps loss ? to assist in charging on cloudy/ windy days? Can Ziggy or anyone assist on feedback ? First off – going with a windgen is a savvy addition – it charges at different times to other power sources like solar or the boat’s alternator – so that’s a great start. Stepping up from 12V to 24V is not going to be easy though – it can be done, but it’s a bit complicated, and expensive. The first option is a step-up MPPT – like the GSL BMPPT-150 (http://www.gsl.com.au/bmppt150.html) but those are designed for charging 24V batteries from 12V solar panels, so that might not work with a 12V windgen. You’d have to check that with GSL themselves. The other step-up option is a 12V to 24V battery charger (boost charger) but again, this is designed for charging from a 12V battery, so you’d need to add a 12V battery for the windgen to charge, and then feed this into the boost charger to charge the 24V batteries. The simplest may well be to swap the 12V windgen for a 24V one. There may be logistical or other implications, but at the end of the day this might be the best option. So, a windgen is definitely a great addition – stick with that – just depends how easy it is to get your hands on a 24V one. Re PWM vs MPPT… isn’t the latter supposed to be better if there’s a bit of cloud around? And the temperature effect…. 40 C might be a reasonable assumption for the Northern half of the country in summer but the Southern? In winter where I live and in which I do most of my camping apart from the far North, I’m happy to see 25. Glad you enjoyed reading the Blog, and your questions are both spot-on. First, if there’s cloud around then the panels will be cooler and the panel voltages higher, so the MPPT will be able to convert this into more current at 12Volt. Also, according to the guys at the Solar Centre in Alice Springs (DKASC), in cloudy weather we get a “scatter effect” on the sun’s rays that can increase the panel’s output. So yes, the MPPT will give us more output in cloudy conditions than a PWM. And second, if you’re in a region where 25 deg is the high side of temperatures, then again, the panel voltages will be higher and the MPPT can turn this into more current for our batteries. I guess the upshot is that an MPPT will seldom perform worse than a PWM regulator. But I have a scottish surname, so cost tends be high on the list for me, and that’s where the PWM wins. And the money saved by getting a PWM instead, can be spent on extra solar which more than makes up for the gains of an MPPT. But if you’ve already invested in a good MPPT – no problem at all! – it will always maximise the battery charging current.